Many well-known faces from the Salvation Army brass band world, plus some others, gathered at Bromley Corps on 29 August 2017, forming a band to celebrate the 91st birthday of Major George Whittingham. Several members of the South London Fellowship Band, which was founded by Major Whittingham, were included in the group. A similar event was held last year for the Major’s 90th birthday, and was so successful that it was repeated this year. 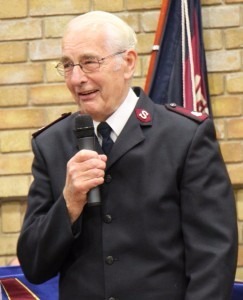 Major Whittingham conducted most of the items during the evening, as well as serving as compère. The program lasted just over two hours – quite an achievement of stamina as well as memory as many of the items were conducted without a score. The program commenced with the hymn tune “Pilgrims”, followed by the march The Canadian. Many Salvation Army classics, such as Army of the Brave and Just As I Am were included. Many soloists and ensembles were featured during the program. Guest soloist Tom Neilson played the cornet solo Glory to His Name. Items from the classical repertoire included Solveig’s Song, played by Major Whittingham’s great-nephew Kevin Whittingham on flügelhorn, and The Swan, presented by the tenor trombones. Bugler’s Holiday was presented by the cornets, who also joined with the trombones for Never Give Up. The euphoniums were featured in a duet written by Derick Kane, That’s the Spirit, which he played with Adrian Horwood. 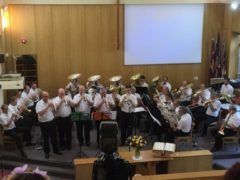 Ben Dixon presented the tuba solo Celestial Morn, conducted by Darrell Scholes. The grand finale of the event was Eric Ball’s masterpiece The Kingdom Triumphant. It left the band breathless with its long, slow phrases and left the audience, if not breathless, enthralled by the sounds and variety of music heard throughout the evening. This article was posted in News and tagged Adrian Horwood, birthday, concert, Darrell Scholes, Derick Kane, George Whittingham, Kevin Whittingham, South London Fellowship Band, special event, Tom Neilson on 14 September 2017 .